Automatic transfer switch is used to automatically switch between common power source and backup power source. It can be used to detect the circuit. When the common power supply fails, the load is automatically switched to connect the backup power by the dual power ATS and can be operating normally. Due to its safe and reliable feature, ATO automatic transfer switch can be widely used in the electrical system. How does the transfer switch work? Let’s briefly learn about the working principle of automatic transfer switch first. When the utility power is normal, the function key of ATS is in the automatic gear, that is, the circuit breaker for standby power is off and the circuit breaker the utility power is on, so as to protect the normal connection between the utility power and the load. The ATS microcomputer control circuit will detect the voltages of two power sources and make a judgement about the detection result. When any phase of the utility power fails, the dual power automatic transfer switch will convert the load power supply from the utility power to the standby power. When the utility power recovers, it automatically switches back to the common power source. If it has detected that the standby power failed, the alarm will ring to remind the user to repair the backup power supply as soon as possible, to guarantee the normal power supply. 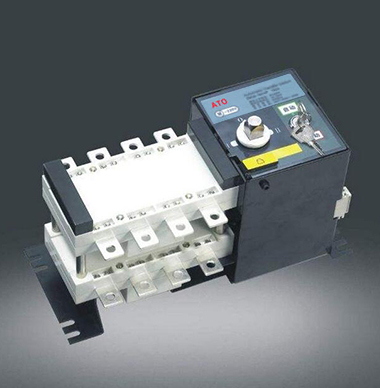 ATO automatic transfer switches are available for operating current ratings from 6 amp to 800 amp, with 3 pole and 4 pole. It has compact size, easy to install and operate and it is widely used in residential areas, military facilities, hospitals, shopping malls, airports and so on. Here is provided a price list of ATO automatic transfer switch for your reference. For more detailed information, just move in to the product pages. Note: The prices in the table are just for your reference. If you want to get the latest quotation, please feel free to contact us. Generally, it's cheaper than the price in the table. How to Debug Automatic Transfer Switch?